Sara's sitting at the table with her laptop and a cup of coffee, tapping away at the keys. Frank's watching television, and Tabitha is making herself a sandwich in the kitchen. 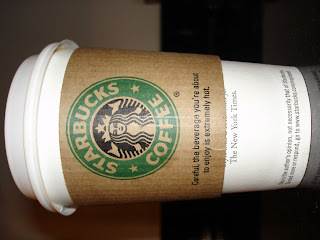 The first starbucks opened in Seattle actually... unless you meant the first starbucks in NY specifically, not overall? Yeah, I meant the first Starbucks in NY. overall, what was it..89? (Scott's useless for this kind of trivia) I know they're advertising it like crazy now. Free Pike Place roast on Wednesdays! Ha! That last comment sounds just like Sara. Although we're all pretty caffeinated. I'm by no means addicted, but I swear Scott only drinks coffee, especially when he's working, and Billy is certainly no stranger to it.